A Smart car owner returned to their vehicle to find all four wheels had been stolen. The tiny car was targeted in Brent, north west London, sometime on Tuesday morning. 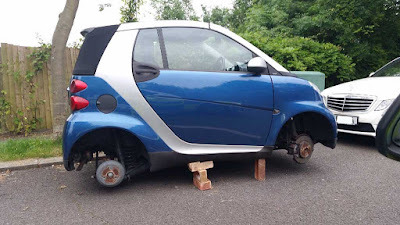 After the unusual theft of all four wheels, the stricken vehicle was left propped up on bricks. Police have appealed for information following the theft. It is not known where Brent the theft occurred.